MANILA - The country’s hosting of the 2019 Southeast Asian (SEA) Games will push through despite the deadlock over the 2019 national budget, House Speaker Gloria Macapagal-Arroyo said Friday. In an interview before speaking as guest of honor at the 32nd Biennial Convention of the Federation of Filipino Chinese Chambers of Commerce and Industry, Arroyo said that the budget for the SEA games had been reduced, but not by the House. Arroyo explained that government can always tap savings to fund the hosting of the regional Games. The games are slated to be held at the New Clark City in Tarlac, where several facilities are under construction. “Well it will push through but I understand not from our side that there was a reduction in the budget so I don’t know to what extent the reduction was as I just got a report from the panel that it was reduced. But you know, there’s always the option of augmenting the budget from savings of other components. There’s always that option,” she said. House Deputy Speaker Prospero Pichay, who is also Philippine Olympic Committee executive council member, explained that there are limitations to the use of savings. “From savings, you know if you get from savings you have to spend it for the same purpose. ‘Di naman pwede savings ng DPWH (Department of Public Works and Highways) gagastos mo sa sports, madadali pa rin sila (You cannot spend savings of the DPWH for sports, they will be flagged for that). It will be disallowed by COA (Commission on Audit),” Pichay said. Pichay recalled that the budget for the Philippines' hosting of the SEA Games was originally over P7 billion and lodged at the Department of Foreign Affairs (DFA) under various regional offices when Alan Peter Cayetano still led the agency. Cayetano is also chair of the Philippine SEA Games Organizing Committee. Cayetano resigned from the posts when he filed his candidacy for Taguig representative. Pichay said the bicameral conference committee cut the budget to P5 billion and allocated it to the Philippine Sports Commission (PSC) during deliberations on the proposed budget. He said that with the impasse on the budget, there really is no money to spend. “Since ‘di pa na-approve 'yung 2019 (since the 2019 budget has not been approved) because the senators refuse to sign it, then right now there is no money for the organizing committee and of course there’s no money for training and purchase of equipment for our athletes,” he said. Pichay explained that the infrastructure was funded separately from the Bases Conversion Development Authority and was not affected. Pichay also revealed that during the discussions, there was a conclusion that the original budget proposal was too much. “Kasi yung amount na P7 billion sobra ‘yun (The amount of P7 billion is too much). The last time we hosted the SEA Games we only spent around P500 million. When I asked [PSC] Chairman Butch Ramirez sabi niya P1.5 billion malaki na ‘yun, ok na ‘yun (he said P1.5 billion is enough),” he added. The Department of Budget and Management, meanwhile, said the hosting will be funded despite the budget impasse. 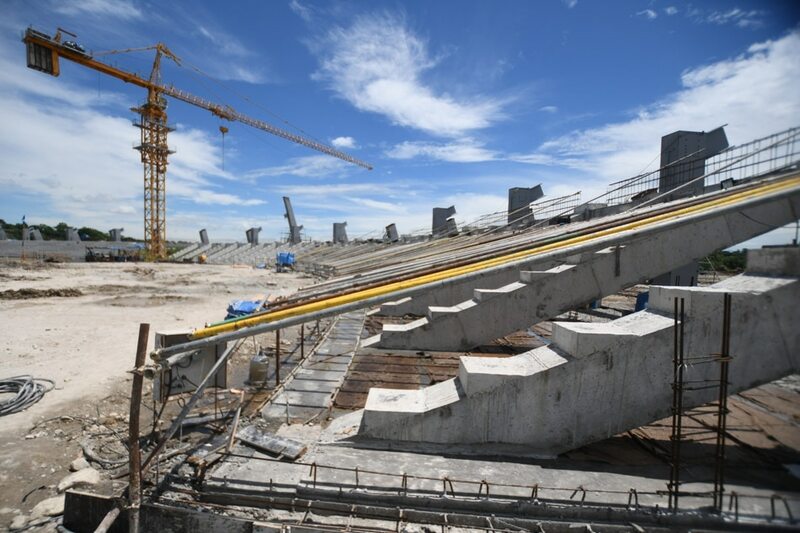 In a statement, the DBM said the construction of sports facilities for the SEA Games "is well underway" through a Public-Private Partnership (PPP) agreement. Non-infrastructure requirements can be partially funded by the National Sports Development Fund. Other possible sources of funding will also be evaluated should the budget impasse drag on, the DBM said. "All the necessary requirements for the hosting of SEA Games will be financed, regardless of the outcome of the budget impasse," the statement said. However, the agency stressed that it was "still hopeful" that Congress could resolve the budget deadlock and submit the enrolled bill to President Rodrigo Duterte for signing. Senate President Vicente Sotto III has refused to sign the budget after Sen. Panfilo Lacson claimed Arroyo realigned P25 billion to favor certain lawmakers, which she denied. The government is operating on a reenacted budget and the Palace and finance officials have warned that remaining in this setup could affect the country’s economic growth for 2019. The Philippine Olympic Committee (POC) on Thursday said the country would push through with its hosting of the 30th SEA Games, downplaying reports that it might lose the opportunity due to budget constraints.